Note: The box has a small approximately 2cm hole in it as per the picture (the price sticker is 1.5cm in diameter to give you an idea of the size of the hole) but the contents are in perfect condition. Ravensburger 9,000 Piece Jigsaw Puzzle. A high quality jigsaw puzzle manufactured by Ravensburger Puzzles, recognised as the world's leading puzzle maker. 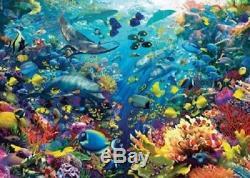 A 9,000 piece jigsaw puzzle measuring 192cm x 138cm when completed. Hand-made cutting tools are used to ensure that no 2 pieces are alike meaning that all pieces really fit. Perfectly interlocking, durable puzzle pieces. Heavy linen paper yields a non-reflective puzzle surface. 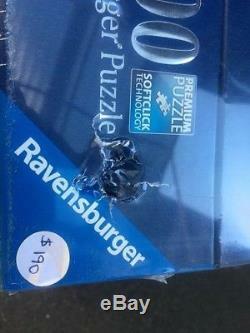 This jigsaw puzzle comes in a sealed retail box. 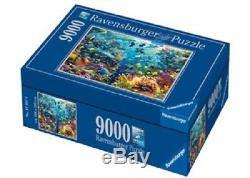 The item "Ravensburger 9,000 Piece Jigsaw Puzzle Underwater Paradise (Damaged Box)" is in sale since Thursday, March 22, 2018. This item is in the category "Toys, Hobbies\Puzzles". The seller is "carraramindspace4211" and is located in Tweed Heads. This item can be shipped worldwide.